It’s a lollipop. Specifically, a lollipop that Cliff Han says tackles what he believes is the root cause of environmental allergies, rather than the symptoms. The Los Alamos Co-Op now offers locally made AllerPops in its supplement section. AllerPops are prebiotic lollipops that relieve allergy symptoms like nasal congestion, throat irritation and red itchy eyes by promoting a healthy respiratory tract and healthy immune system. 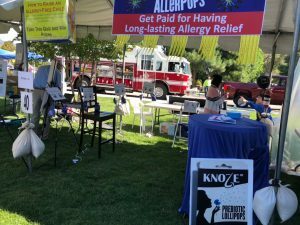 AllerPops were developed by Cliff Han, Ph.D., a medical doctor and biologist who worked at the Los Alamos National Lab for 18 years before starting his business, Knoze Jr. in 2014. Just before starting his business, Han’s 1-year-old son got allergies. He made it his mission to find the underlying reason people get allergies so that he could create a remedy that actually solves the problem rather than just cover it up. When he got allergies, too, he found the opportunity to find the answers he was looking for. He started studying himself, and soon unlocked the unexpected secret to allergies. From that research he developed his Theory of Negative Triggers (TNT) led to the development of AllerPops. With AllerPops, Han’s family finally got relief from their allergy symptoms. People who have tried it are thrilled with the results, because after only one treatment they no longer need allergy pills, get shots or suffer through the allergy season. Look for AllerPops at the Los Alamos Co-Op at 95 Entrada Dr., in Los Alamos. To find out more about AllerPops, visit www.knozejr.com. You can find AllerPops in the supplement section. SUZHOU, China, Sept. 18, 2018 /PRNewswire/ — Creator and founder of the all-natural AllerPops allergy remedy (https://knozejr.com/) recently presented his theories related to allergies and their genesis to an expert international audience. Dr. Han’s research is based on a single yet profound premise: allergies are reversible. Using prebiotics to promote probiotic solutions, Han offers a new and simple way to tackle the worldwide problem of seasonal allergies. Cliff Han presents his research to an audience of Cold Spring Harbour Asia conference, Frontier of Immunology in Diseases and Health. Fellow meeting participants, Dieter kabelitz (left) and Cliff Han toured Suzhou on a riverboat. Based on the research performed to find relief for both he and his son’s allergies, Dr. Han unlocked an unexpected secret to the formation of allergies. The discovery led Han to the formation of a prebiotic compound as a way to apply his Theory of Negative Trigger (TNT) to help people take control of their allergies in completely unique way. TNT expounds on prebiotic stimulation of probiotic interaction in a variety of bacteria naturally present within the oral cavity, specifically: streptococcus and veillonella. Research shows that veillonella and streptococcus are mutualists which produce short chain fatty acids (SCFA). These SCFAs pacify the immune system. Since allergies are related to the unchecked action of the immune system in response to allergens, increased SCFAs should reduce allergic response to allergens and in turn lead to the elimination of unpleasant allergy symptoms. Dr. Han’s research clearly indicates exactly that. Overall, subjects with increased levels of veillonella present within saliva samples were found to have marked lower instances of allergic response to seasonal allergens. Using Dr. Han’s prebiotic formula, oral probiotics were then specifically increased in subjects with allergies. Those subjects subsequently reported that their allergies were far less severe and, in some cases, eliminated altogether. There is a direct correlation between the level of specific probiotics present within subjects and a decrease in seasonal allergic responses. Maintaining low-level fevers is more beneficial than eliminating them. Infants and children should receive their seed microbiota from parents and siblings, not pets or general environments. Periodic fasting to boost the immune system might be beneficial (similar to the benefits received from a sauna). Correct hygiene practices and a good diet can help maintain the proper level of probiotics from the inside out: intestinal tract, respiratory tract and skin. Probiotics should always be reseeded and promoted after severe interruptions in the microbiota (from antibiotic use, illness, etc.). The microbiota switch attached to the power of the immune system may be manipulated readily at will, possibly having other clinical applications such as other allergies, autoimmune diseases, inflammations and perhaps cancer treatment. AllerPops from Knoze Jr. is a product developed by Cliff Han. A trained physician in China, Han later worked in the Los Alamos National Laboratory for two decades as a biologist. Suffering from personal, debilitating allergies, Han decided to craft the perfect natural solution: an easy-to-eat lollipop that contains a mixture of prebiotics which encourage healthy flora growth in the body. Using the same logic that fuels the current probiotics food trend of yogurts and smoothies, Han’s patented allergy candy facilitates the growth of the body’s own natural flora; thus encouraging the delicate balance of microorganisms which can help ameliorate allergic reactions. Learn more about Knoze Jr. and AllerPops at Knozejr.com. Any inflammation relief obtained by using the product lollipop is supported only by theory and personal observations by the lollipop inventor (e.g. US Pat No._9,795,579) and may not be a typical response. Any representations made herein do not constitute medical advice, and it is recommended that a qualified medical person is consulted before use of the product lollipop. Parental supervision for persons less than 18 years is required according to included instructions. LOS ALAMOS, N.M., July 18, 2018 /PRNewswire/ — Cliff Han, the maker and founder of AllerPops recently announced a call to gather feedback from customers of his unique allergy-fighting prebiotic lollipops (https://knozejr.com/share-your-experience/). In an effort to connect new customers with the user experiences of past customers, AllerPops initiated #iTuneMyAllergiesUsingAllerPops. Customers are invited to use the hashtag to create and post text messages and video selfies using AllerPops, all while receiving an Amazon gift card or a People Pay award of five dollars as a thank-you gift for each such valid post. Knoze Jr present AllerPops to the local community at ScienceFest of Los Alamos, NM. Na Leng, and Brian Han help prepare the booth for the quiz on “how to raise an allergy-free child. Post a 30 second selfie video before using AllerPops, documenting the history and symptoms of their allergies. Post a five second video of themselves eating an AllerPop lollipop. Post a 20 second selfie video after the last cycle of using the AllerPop lollipops, documenting the overall results. Merge the footage of pre and post-lollipop use, releasing that footage on Facebook, Twitter or Instagram, while also stamping the footage with the #iTuneMyAllergiesUsingAllerPops and #allergies hashtags. All previous and current customers with a proof-of-purchase of AllerPops are eligible. Each valid proof is good for one award. Each selfie-video or text-entry post must contain the #iTuneMyAllergiesUsingAllerPops and #allergies hashtags. The post must be consistent with the theme of the AllerPops program, regardless of whether the comments are positive or not. A proof-of-purchase of the AllerPops product, such as an Amazon order ID or a photo of the receipt. Provide a link to the relevant online post made by the user. Choose a preferred way to receive the award: either an Amazon Gift Card or a People Pay payment. Please also provide an email address associated with an Amazon account or a cell phone number for the People Pay transfer. 4. Sleep with the baby in the same bed. 5. Not bath in first week (gentle wipe openings with wet cloth should be sufficient). Not bath too frequently afterwards. Sweating is not a reason for a bath. Sweat produces conditions, such as high salt concentration, that promote and sustain skin probiotics. 6. Mouth feeding to add foods from 2-3 months (with these sequences: water, soup, semisolid and then solid; starch-rich food, nuts, protein-rich and then veggies). Adult-chewed food is easy for baby to digest, prevent infection, help establish oral and gut microbiota, likely prevent allergies. The caregiver should have no acute infection when doing mouth feeding. 7. Eat AllerPops Prebiotic Lollipops AFTER taking antibiotics, and the targeted disease is cured. Journey To Halt Allergies Leads To Startup Company Knoze Jr. Corp. The new version of User’s Manual has been improved for simplicity and effectiveness. It is easier to follow and likely faster in getting allergy relief. It was modified according to customer’s feedbacks. Anyone who buy Knoze Jr. Prebiotic Lollipop should download the new User’s Manual at https://knozejr.com/users-manual/ and follow the instructions to use. We encourage everyone who contacted us about our product and service. Your feedback can only make it better. Thank you! Our product is now for sale on Amazon on February 11, 2018, with a 50% discount for the first month until March 10, 2018 with satisfaction guaranteed! We encourage all customers to contact us through our website at knozejr.com/contact. Below you’ll find the answers to several frequently asked questions. What are the most important things to remember when using this product? Remember to hold the lollipop in your mouth as long as possible when eating it in order to clear the oral micro-ecospace, and do not chew or swallow it whole. We have not observed any side effects. All ingredients found in our product are natural, such as natural sugars, salt, fibers, and amino acids. Will use of this product cause tooth caries? The lollipop, if taken in concurrence with our instruction manual, is intended to promote probiotic growth. These bacteria have one special function, which is to convert lactic acid to less acidic short chain fatty acid. It is likely that the use of this product will, in fact, reduce tooth decay, although this is not its intent and it should not be taken with this goal in mind. Talk with your dentist if you have any special oral conditions. What if, for whatever reason, I am unable to gargle or rinse my mouth out with water? An alternate method is wiping the tongue and other oral surfaces with a washcloth dampened with water of 115 – 120 degrees Fahrenheit for up to 10 minutes. Frequently rewet the cloth to keep it warm.